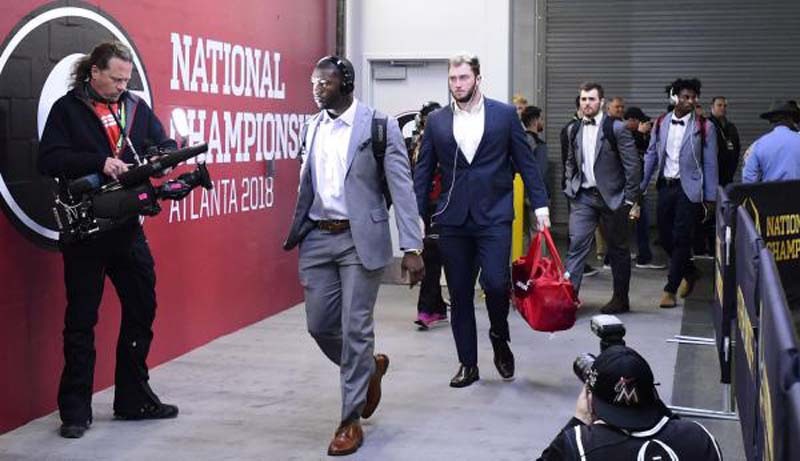 The holdup in reaching a contract agreement between the Chicago Bears and first-round draft pick Roquan Smith appears to be the NFL's new rule on players lowering their helmets on tackles, multiple news outlets reported Saturday. [post_ads]The league's new policy allows for suspension, fines, ejections and penalties when a player lowers his head to make a tackle. Bears linebacker Danny Trevathan was suspended last year for a helmet-to-helmet hit against Green Packers wide receiver Davante Adams before the new rule was implemented. A player such as Smith who makes numerous tackles is more susceptible to these types of hits, his agent and others argue. "For both sides, it's more of a language deal, a language-type deal," Nagy said, according to the Chicago Sun-Times. "Again, for me, as a first-year head coach going through this, my thing is just collaborating with (general manager) Ryan (Pace) and what they have going on with the agent and making sure that we understand, together, I need to as a head coach just continue to keep plugging away with what we have and who we have. "We'll eventually get that thing figured out. The biggest thing for our organization and for our players is for me to be focused on who's here right now, and that's what I'm doing." Pace and Smith's agents have not spoken to the media about the linebacker's demands. Smith, an All-American linebacker and Butkus Award winner last year at the University of Georgia, has missed eight full practices so far. "We will continue to keep trying to do our best to make this thing happen," Nagy said. "At the same time ... we need to focus on who's here right now, right?" With Smith and Trevathan (hamstring) absent, third-year linebacker Nick Kwiatkoski has filled in during early training camp practices. Smith and New York Jets quarterback Sam Darnold are the only remaining unsigned first-round picks from the 2018 NFL Draft. "I know I keep saying it's part of the process. It is," Nagy said. "There's other teams that are just as we go through this process, it's us and really New York right now. We understand that, he understands that. We will continue to keep trying to do our best to make this thing happen. "At the same time, what we need to do is we need to focus on who's here right now, right? That's the realism of it all. There's valuable reps that are going on with our guys. We appreciate all that hard work and effort because we're shorter with numbers, but we just keep going forward, we worry about what we can control as a team. And we keep plugging away."